Parahippocampal cortex (PC) is located on the medial temporal lobe. Together with the amygdaloid complex and hippocampal formation it represents a part of large and complex system that is referred to as the medial temporal lobe – MTR. It connects numerous regions of cerebral cortex to hippocampus and represents part of the limbic lobe which is referred to as visceral or emotional brain. Parahippocampal cortex is characterized by specific morphology and belongs to transitional cortex type lying between phylogenetically younger neocortex and phylogenetically older archicortex, and is thus referred to as periarchicortex or peripaleocortex. Its structure is described as consisting of mainly five cell layers, starting from molecular or plexiform layer (the layer I) containing few cells and a thick bundle of horizontal fibers. The layer II contains large stellate and modified hyperchromatic pyramidal neurons grouped in clusters. The layer III contains pyramidal cells of medium size, while the layer IV, referred to as lamina dissecans, is located at the deep border of this layer and is cell deficient and fiber sufficient. The layer V exhibits the most distinctive structural variations and contains small pyramidal cells. The layer VI contains neurons of various sizes and shape. It is generally accepted that PC consists of rostral part or perirhinal cortex (PRh), middle portion or entorinal cortex (EC) and caudal portion or posterior parahippocampal cortex (PPC). External morphology of MTR is characterized by rhinal groove anterolaterally and collateral groove posterolaterally. Medial portion of this lobe contains semilunar gyrus, uncal part of hippocampal formation and gyrus ambiens. The presence of verrucae area at the EC layer represents one of the most important external morphological characteristics of MTR as well. The medial temporal lobe as a whole is associated with the process of memorizing personally experienced (autobiographical or episode memory) events whereby anterior part of hippocampus is considered to be the most important for memory process. Its functioning is based on bidirectional connections with cerebral cortex and hippocampus, and systematization of pathways on three levels. Afferent connections ending in the medial temporal lobe originate mainly from the limbic lobe, visual, auditory, somatic and multimodal asssociation zones. Efferent connections of perirhinal part are projected in the lateral cortex and those of parahippocampal cortex are projected in the medial entorhinal cortex, with information eventually converging to hippocampus. Changes that occur in this system are associated both with normal and pathological aging of the brain. This is confirmed by numerous studies indicating that both incomplete and complete memory loss during aging are preceded by atrophy of MTR structures, whereby a significant drop in PpC volume is found. The studies show that there is a connection between the volume loss of PpC and the volume loss of anterior hippocampal formation. Taking into account that posterior parahippocampal gyrus is closely connected to memory function volume decrease of these structures with aging correlates with decrease of cognitive function. Cellular changes are at the basis of macroscopic changes. Changes that occur in nerve cells may lead to reduction in their volume, deposition of abnormal molecules, and formation of neurofibrillary degeneration and senile plaques. In recent years, a great deal of research has been done on correlation between corpora amylacea, the process of aging and neurodegenerative processes accompanying it. Corpora amylacea (CA) represent structures that are found to a great extent in the structures of central nervous system during normal aging, and their number significantly increases in different neurodegenerative diseases such as Alzheimer's disease, multiple sclerosis and Pick's disease. They are usually localized in subpial, ependimal regions and hippocampus, but may be found in different number in other structures of central nervous system as well. They are also referred to as Lafora, Bielchowsky and polyglucose corpuscles. Purkinje was the first scientist to describe them in 1837. Then in 1851 Virchov pointed to the fact that they exhibited the same reaction as cellulose to iodine or other staining. Under the light microscope, CA in humans tend to have a spherical shape and diameter ranging from 0.5-30 μm, ie. 10-12 μm approximately. Besides spherical shape, CA may have oval, and rodlike shape. Occasionally, there occurs fusion of two or more CA. Ultrastructurally, they consist of bundles of short linear filaments (8-12 nm). Their nucleus consists of mucopolysaccharides (88%) and protein (4%). There are opposing opinions whether CA were found in the structures of the nervous system, neuronal or glial product activities. Therefore, they were described as oval, cytoplasmic, glycoprotein inclusions of astrocytes, and on the other hand, as the product of hyaline degeneration of oligodendrocytes, as well as protein precipitates of lymphoid and hematogenic origin and eventually as a post-mortem artifacts. It is most likely that CA originate from small Gomori-positive granules present within astrocytes, and mediation of specialized mitochondria and activation of hemoxygenase., So, it is usually believed that their formation is a consequence of oxidative stress, mitochondrial abnormalities, and disorders of iron levels in the aging astrocytes. Besides their beneficial effects, CA may participate in potentially harmful reactions of redox iron or may disrupt the normal flow of cytoplasm within astrocytes. The formation and development of CA may be attributed to chronic stress, and the possibility that they represent product of secretion of the endocrine gland function, or even an accumulation of circulating cellular debris. Development of mucopolysaccharide nucleus preceding the formation of CA, serves as a matrix in which cellular debris is deposited, formed as a product of degeneration of neurons, their axons, oligodendrocytes and myelin. Another layer, probably of astrocyte origin is further formed around the nucleus. When production of CA in the brain reaches critical levels, the body loses its ability to continue their production and various changes develop including senile plaques and neurofibrilary degeneration, which is the sign of serious damage to neurons and nervous tissue in general. Such changes may be present during normal aging and in some neurological disorders. Tissue of the uncus of parahippocampal gyrus on the right hemisphere of the brain of 30 cadavers was used in the study. The tissue was obtained from autopsies performed at the Forensic Medicine Institute of the Niš Medical Faculty. The material was taken from individuals aged 16-93 years whose medical records showed that the cause of death was mostly an accident of no verified damage to the CNS. We analyzed all 30 cases (16 males and 14 females) whose age ranged between 16 and 93 years (average age 54.5 years).The youngest male person was 6 years old and the oldest was 84 years old (average 50 years), while the youngest female person was 50 years old and the oldest was 93 years (average age 71.5 years). Samples were taken within twelve hours from the moment of death. Using scalpel, scissors and tweezers 1x1 samples were dissected at the level of uncus of parahippocampal gyrus on the right brain hemisphere. Samples were then fixed in 10% phosphate-buffered formalin for the next 24 h. Afterwards, 0.5×0.5 cm tissue blocks molded in paraffin were made. Paraffin molds were further used for making 5 μm sections which were analyzed by standard histological procedures and stained with HE and AB PAS method. Twelve out of 30 samples were analyzed by immunohistochemical, alkaline phosphatase -antialkaline phosphatase method (APAAP) (Dako Kit) (24). APAAP method represents sensitive and easy to perform enzymatic method with unlabelled “bridge” antibodies. Firstly, monoclonal mouse or polyclonal rabbit antibody were applied and secondly polyclonal “bridge’ antibody was applied at this stage. Soluble complex of alkaline phosphatase and mouse monoclonal alkaline phosphatase antibody was applied at the final stage of staining. The staining procedure itself consisted of five phases. The following antibodies were used for staining of histological sections: rabbit polyclonal antibody specific for cow S100, a monoclonal mouse anti-human antibody specific for neuron enolase and a monoclonal mouse anti-human antibody specific for glial fibrillary acidic protein (GFAP). Morphological analysis was performed using light microscope “Olympus CHK2.” It consisted of histochemical and immunohisto chemical part. During histochemical analysis morphological characteristics of CA were examined on PC preparations stained with HE and AB PAS method under 400 x magnification. The analysis of shape, size, number and distribution of subpial and subcortical part was performed under 100x magnification. During the immunohistochemical analysis CA reaction type to S100 polyclonal antibody and NSE and GFAP monoclonal antibody on subpial and subcortical region of PC were examined under 400x magnification. Morphological analysis showed that CA were present in 25 cases in subpial part of the cortex, while they were not detected in five cases (three males and two females), average age 59 years. Corpora amylacea were not observed in subpial and subcortical part of PC in one forty-year male case and in subcortical part in one 43-year male case. On tissue sections amyloid corpuscles had a round or oval shape with regular edges, indicating that their shape did not change significantly during the aging process. In elderly cases with more prominent CA presence fusion or confluent forms were noticed. Other forms of CA were not observed in our study. In HE stained sections they were blue due to possible presence of calcium in their structure. Their structure was mostly homogeneous, but the intensity of their colour ranged from light blue to dark blue, which made it difficult to differentiate them from CA hyperchromatic nuclei of surrounding cells, both in subpial and subcortical part of the PC. By applying AB PAS method, CA were purple due to possible presence of mucopolysaccharides in their structure. CA of inhomogeneous structures predominantly in subpial part of PC were detected rarely in elderly cases, whereby nucleus of different size and thin peripheral lamellae on the surface were noticed. The presence of CA was more prominent in subcortical part compared to subpial part of PC. As far as aging is concerned, younger cases were characterized by less prominent presence of smaller CA. In subpial part of the PC they were localized just beneath pia mater, while in the deeper parts of the molecular layer they were noticed sporadically [Figure 1]A. 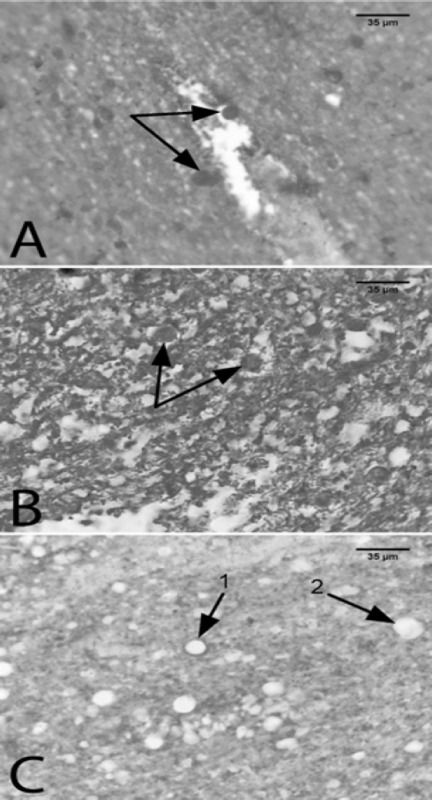 In this part of the cortex within neuropilus, small, round, predominantly hyperchromatic cell nuclei of PC molecular layer were noticed [Figure 1]A. Blood vessels, arterioles and venules were most often noticed in the space between pia mater and cortical surface, while no significant number of CA was localized in their surroundings, outside molecular layer of PC. 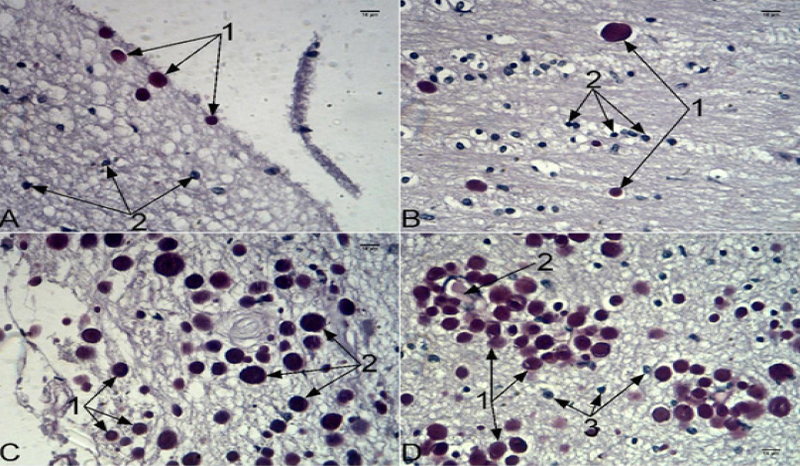 Figure 1: A – SubpiallocalizetCA in a 43 years old male case; 1 – subpiallocalizet CA; 2 – jedraæelijamolekularnogsloja; B – Subcortical localizet CA in a 26 years old male case; 1 – CA; 2 – nuclei of glial cells; C – Subpiallocalizet CA in a 78 years old male case; 1 – CA localizetin the superficial molecular layer; 2 – CA – localizet in the deeper molecular layer; D – Subcortical localizet CA in a 63 years old female case; 1 – CA; 2 – blood wesswlsaurandded large volume of CA; 3 – besides nuclei of glial cells; AB PAS; 400x. In subcortical part of PC, besides nuclei of glial cells, predominantly oligodendrocytes, [Figure 1]B and arterioles and venules, rare irregularly distributed CA were observed [Figure 1]B. Elderly cases were characterized by significant presence of large CA in subpial part, deeper parts of molecular layer and particularly subcortical part of PC [Figure 1]C. Subcortically, CA were predominantly localized around blood vessels, but a significant number was also present in parts of PC between blood vessels [Figure 1]D. Using immunohistochemical analysis, we examined reaction of CA to applied NSE and GFAP monoclonal and S100 polyclonal antibody. Homogenous, bright red neuropilus was dominant in PC preparations stained with anti - NSE antibody. Lamina molecularis contained nuclei of glial cells, rare neural cells and in some cases numerous CA. They were characterized by small, blue stained round nucleus with nucleolus and sparse red stained NSE positive perikaryon. In subcortical part besides small, round, blue stained hyperchromatic nuclei of glial cells different number of CA was observed. CA profiles were characterized by a positive reaction to global anti - NSE antibody, which made it difficult to identify them within neuropilus of molecular layer and subcortical zone of PC. Corpora amylacea were characterized mostly by GFAP negative reaction. However, very often in their immediate surroundings, in neuropilus, punctiform GFAP positive reaction was noticed, probably originating from cross-sectional extensions of neighboring astrocytes. In some cases, GFAP positive reaction was rarely found at the very peripheral parts of CA in the form of continuous, dark brown stained peripheral lamellae. Corpora amylacea were observed subpially in molecular layer and, to a greater extent in subcortical zone of PC. They were largely characterized by positive reaction of the S100 polyclonal antibody, which actually consisted of two subtypes of positive reaction: the first one involved CA with a positive reaction to S100 protein along the entire surface of their profiles, with CA that were very difficult to detect within S100 positive neuropilus due to characteristic red colour of their profiles; the second one involved CA negative reactions in their nucleus and positive reaction to S100 protein in their periphery in the form of peripheral lamellae. Neither of these two subtypes of positive reaction was observed to be dominant in subpially and subcortically localized CA. Corpora amylacea (CA) are spherical structures composed mainly of polysaccharides which are thought to normally accumulate in perivascular, subpial and subependimal astrocyte extensions during normal aging of the brain,, although some authors attribute their origin to neurons and oligodendrocytes. Their increased number is observed in various neurodegenerative disorders such as Alzheimer's disease, multiple sclerosis, Lenox-Gastaut syndrome, Lafora-type of mioclonal progressive epilepsy and polyglucose disease in adults., In our study, parahippocampal CA are observed to be localized predominantly in the subpial part and subcortical white matter, which is in accordance with the findings of the aforementioned authors In elderly cases, subpial CA are noticed in a greater number in the molecular layer of PC as well and increased number of subcortical CA clusters around arterioles and venules of medium caliber, in Virchow -Robin region, which is in accordance with literature data. Electronmicroscopic CA have regular round or spherical shape. In addition, rod-like, concentric or target-like shapes of CA are also reported, with central regions more densely stained than peripheral ones. However, such forms were not detected in our study. Although CA were mentioned in literature a long time ago, very little is known about their origin and function. Since ultrastructure of CA suggests that they originate from one cell type, their etiology has not been fully elucidated so far. In earlier studies, certain number of different glycoproteins was identified as the main constituent of CA thought to accumulate in neuropilus as a result of both normal and pathological aging. The presence of mucopolysaccharides in their structure was confirmed by their AB PAS positive reaction observed in our study. In recent years, the role of excitatory neurotransmitters in the neuronal damage and the consequent formation of calcium precipitates has been highlighted. Since the inclusion of these products is considered to represent products of degeneration present during aging process of the brain, it is considered that chronic cellular stress may represent one of the potential causes of their formation. During this process, it is likely that CA play an important part in the integration and sequestration of toxic products of cell metabolism. The presence of carbohydrate components can be explained as a consequence of acquired defects of glycogen metabolism that progresses during aging and that it is a cause of extensive accumulation of CA in CNS in the elderly. Some authors believe that under normal circumstances polymerized glucose molecules may create the nucleus for deposition and sequestration of products of oxidative damage to mitochondria, some other proteins, or potentially harmful substances and products that are formed and cannot be broken down during the aging process. The presence of oligodendrocytic components of CA is explained by their deposition through the extracellular space to astrocytes in which they are deposited. Potentially harmful substances that occur during the aging process as a result of increased activity of free radicals may lead to lysis of proteins, lipids and mitochondrial injury. In addition, this may make astrocytes play a major role in the defense against these potentially harmful products by breaking them down. Cessation of neuronal division upon birth and their degeneration during aging may be the cause of the increased presence of CA in the CNS in neurodegenerative disorders. Immunohistochemical methods confirmed presence of ubiquitin, taurine, and tubulin, proteins that are believed to have neuronal origin, as a result of a long lasting neurodegeneration process The presence of neural components in the CA is confirmed by their positive reaction to NSE, detected during our investigation. Damage to neurons and its release from their cytoplasm is supported by increased levels of NSE present in the cerebrospinal fluid of healthy elderly individuals. Corpora amylacea would thus be able to participate in the binding of NSE present in released neuropilus, which explains their positive reaction to anti - NSE antibody. The presence of glial components is observed in CA structures. In the light of this view, Singhrao et al. described the presence of a positive reaction to glial fibrillary acidic protein (GFAP), particularly at the extreme periphery of CA, which is in accordance with the results of immunohistochemical analysis conducted in our study. The positive reaction to anti-PLP, anti-Galco, anti-MOG and anti-MBP antibodies indicated the presence of myelin and oligodendrocyte components in them. Similar conslusion is drawn in our study as well, based on the observed positive reactions of subcortical CA to S100 polyclonal antibody, as certain populations of olygodendrocytes are likely to have positive reaction to the antibody. The reaction to the anti-CA - MRC OX42 marker for mikroglia is negative, which excludes the presence of microglial components in their structure. Thus, it may be concluded that CA consist of a filamentous nucleus which not only contains lycoproteins, and proteoglycans, but is characterized by a negative reaction to the anti -GFAP antibody. However, despite the significant presence in normal and pathological aging of the brain, their precise role in these processes still remains unclear. Figure 2: A – CA positive reaction (arrows) on S100 polyclonal antibody; B – CA positive reaction (arrows) on monoclonal NSE antibody; C – 1 – CA with negative reaction in its core and, mild positive reaction on GFAP monoclonal antibody, 2 – CA with negative reaction on GFAP monoclonal antibody; APAAP; 400x. Corpora amylacea in parahippocampal cortex were detected in 29 samples, subpially in 23 samples and subcortically in 27 samples. Regarding age, in younger cases these structures were observed both in subpial and subcortical region, while in elderly cases they were mainly localized in subpial zone in deeper parts of the molecular layer and in the subcortical white matter clustered around the blood vessels of large caliber. In parahippocampal cortex of younger cases AB PAS positive homogenous corpora amylacea were dominant, while in older cases laminar corpora amylacea were observed to a greater extent as well. Immunohistochemically, we found the presence of a positive reaction along the entire profile of amiloid corpuscles to NSE, which indicates the presence of neural components in their composition, while their reaction to GFAP is mainly negative and positive at extreme periphery, which supports the view that they represent astrocyte inclusions. In most cases the reaction to S 100 is positive, which is justified by the presence of astrocyte and probably oligodendrocyte components in the structure of corpora amylacea. Given the importance of parahippocampal cortex for normal memory functions of the brain, and the fact that little is known about structures labelled as corpora amylacea, we believe that identification of their presence, shape, size and distribution during the aging process might provide useful information in order to further clarify the mechanisms responsible for the presence of cognitive deficits in healthy elderly individuals. To The Institute of Forensic medicine Nis for their cooperation, my mentor Prof. dr Ivan Jovanovic for contributing. There were no conflicts of interest. Parahippocampal cortex (PC), Medial temporal lobe (MTR), Perirhinal cortex (PRh), Entorinal cortex (EC), Posterior para-hippocampal cortex (PPC), Corpora amylacea (CA), Central nervous system (CNS), Alkaline phosphatase -antialkaline phosphatase method (APAAP), Rabbit polyclonal antibody specific for cow (S100), Glial fibrillary acidic protein (GFAP), Neuron specific enolase (NSE), anti-glactocerebrosidase (anti-GALCO), Myelin Oligodendrocyte Glycoprotein (anti-MOG). Van Hoesen GW, Hyman BT, Damasio AR. Entorhinal cortex pathology in Alzheimer's disease. Hippocampus. 1991;1(1):1-8. http://dx.doi.org/10.1002/hipo.450010102 PMid:1669339. Eichenbaum H, Lipton PA. Towards a functional organization of the medial temporal lobe memory system: role of the parahippocampal and medial entorhinal cortical areas. Hippocampus. 2008;18(12):1314-24. http://dx.doi.org/10.1002/ hipo.20500 PMid:19021265 PMCid:PMC2592493. Kahle W, Frotscher M. Color Atlas of Human Anatomy. Nervous System and Sensory Organs. 5th revised edition. New York: Thieme. Stuttgart; 2002; Vol 3. PMid:12034752 PMCid:PMC1084143. Insausti R, Amaral DG. Hippocampal formation. The Human Nervous System, second ed. Elsevier Academic Press. 2008;871- 914. Šimić G, Bexheti S, Kelović Z, Kos M, Grbić K, Hof PR, et al. Hemispheric asymmetry, modular variability and age-related changes in the human entorhinal cortex. Neuroscience. 2005;130(4):911-25. http://dx.doi.org/10.1016/j. neuroscience.2004.09.040 PMid:15652989. Jeffery KJ. Hippocampus and Its Interactions With in the Medial Temporal Lobe. Wiley Inter Science. 2007;17:693-6. http://dx.doi. org/10.1002/hipo.20334. Burgmans S, van Boxtel MP, van den Berg KE, Gronenschild EH, Jacobs HI, Jolles J, et al. The posterior parahippocampal gyrus is preferentially affected in agerelated memory decline. NeurobiolAging.2012; 32(9): 1572-8. Manns JR, Eichenbaum H. Evolution of declarative memory. Hippocampus. 2006;16:795-808. http://dx.doi.org/10.1002/ hipo.20205 PMid:16881079. Lipton PA, White J, Eichenbaum H. Disambiguation of overlapping experiences by neurons the medial entorhinal cortex. Journal of Neuroscience. 2007;27(21 ):5787-95. http://dx.doi.org/10.1523/ JNEUROSCI.1063-07.2007 PMid:17522322. Killiany RJ, Hyman BT, Gomez-Isla T, Moss MB, Kikinis R, Jolesz F, et al. MRI measures of entorhinal cortex vs hippocampus in preclinical AD. Neurology. 2002;58(8):1188-96. http://dx.doi. org/10.1212/WNL.58.8.1188 PMid:11971085. Walhovd KB, Fjell AM, Reinvang I, Lundervold A, Dale AM, Eilertsen DE, et al. Effects of age on volumes of cortex, white matter and subcortical structures. Neurobiol. Aging. 2005;26(9):1261- 70. http://dx.doi.org/10.1016/j.neurobiolaging.2005.05.020 PMid:16005549. Rusinek H, De Santi S, Frid D, Tsui WH, Tarshish CY, Convit A. Regional brain atrophy rate predicts future cognitive decline: 6-year longitudinal MR imaging study of normal aging. Radiology. 2003;229(3):691–6. http://dx.doi.org/10.1148/radiol.2293021299 PMid:14657306. Rodriguei R, Rodrigue KM, Raz N. Shrinkage of the entorhinal cortex over five years predicts memory performance in healthy adults. J Neuro Sci. 2004;24(4):956-63. http://dx.doi.org/10.1523/ jneurosci.4166-03.2004. Laakso MP, Frisoni GB, Kononen M, Mikkonen M, Beltramello A, Geroldi C, et al. Hippocampus and entorhinal cortex in frontotemporal dementiaand Alzheimer's disease: a morphometric MRI study. Biol Psychiatry. 2000;47(12):1056-63. http://dx.doi. org/10.1016/S0006-3223(99)00306-6. Singhrao SK, Neal JW, Newman GR. Corpora amylacea could be an indicator of neurodegeneration, Neuropathol. Appl Neuro-Biol. 1993;19(3):269-76. http://dx.doi.org/10.1111/j. 1365-2990.1993. tb00437.x. Maqbool A, Tahir M. Corpora amylacea in human cadaveric brain age related differences. Biomedica. 2008;24:92-95. Cavanagh JB. Corpora-amylacea and the family of polyglucosan diseases. Brain Res Brain Res Rev. 1999;29(2-3):265-95. http:// dx.doi.org/10.1016/S0165-0173(99)00003-X. Hoyaux C, Decaestecker CW, Heizmann VT, Schafer BW, Salmon I, Kiss R, et al. S100 proteins in Corpora amylacea from normal human brain. Brain Res. 2000;867(1):280-8. http://dx.doi. org/10.1016/S0006-8993(00)02393-3. Schipper HM, Cissé S. Mitochondrial constituents of corpora amylacea and autofluorescent astrocytic inclusions in senescent human brain. Glia. 1995;14(1): 55-64. http://dx.doi.org/10.1002/ glia.440140108 PMid:7615346. Sahlas DJ, Schipper HM. Role of heme oxygenase-1 in the biogenesis of corpora amylacea. Biogerontology. 2002;3(4):223- 31. http://dx.doi.org/10.1023/A:1016223109601. Keller JN. Age-related neuropathology, cognitive decline, and Alzheimer's disease. Ageing Res Rev. 2006;5(1):1-13. http:// dx.doi.org/10.1016/j.arr.2005.06.002 PMid:16084778. Cohan M, Vellone E, Piras G, Talucci C. Quality of life for caregivers of people with Alzheimer's disease. Journal of Advanced Nursing. 2008;61(2):222-31. http://dx.doi.org/10.1111/ j.1365-2648.2007.04494.x PMid:18186913. Naseri M, Mozzeni SM, Pourfathollah AA. APAAP complex: Production and usage in immunocytochemical and immunohistochemical staining. Human Antibodies. 2007;16(3,4):107-15. Nishio S, Morioka T, Kawamura T, Fukui K, Nonaka H, Matsushima M. Corpora amylacea replace the hippocampal pyramidal cell layer in a patient with temporal lobe epilepsy. Epilepsia. 2001;42(7):960-2. http://dx.doi.org/10.1046/j.1528- 1157.2001.01601.x PMid:11488902. Abel JT, Hebb OH, Keene D, Born ED, Silbergeld LD. Parahippocampal Corpora Amylacea: Case Report. Neurosurgery. 2010;66(6):1206-7. http://dx.doi.org/10.1227/01. NEU.0000369196.94664.4E PMid:20495392. Riberio M, Coutinho L, Mugnol F, Hilbig A, Palmini A, Costa J, isar. Corpora amylacea in temporal lobe epilepsy associated with hippocampal sclerosis. Arq Neuropsiquiatr. 2003;61(4):942-5. http://dx.doi.org/10.1590/S0004-282X2003000600010. Selmaj K, Pawlowska Z, Walczak A, Koziolkiewicz W, Raine CS, Cierniewski CS. Corpora amylacea from multiple sclerosis brain tissue consists of aggregated neuronal cells. Acta Biochim Pol. 2008;55(1):43-9. PMid:18246205. Kawashima T, Adachi T, Tokunaga Y, isar. Immunohistochemical analysis in a case of idiopathic Lennox-Gastaut syndrome. Clin Neuropathol. 1999;18(6):286-92. PMid:10580554. Vilchez D, Ros S, Cifuentes D, isar. Mechanism suppressing glycogen synthesis in neurons and its demise in progressive myoclonic epilepsy. Nat Neurosci. 2007;10(11):1407-13. http:// dx.doi.org/10.1038/nn1998 PMid:17952067. Sindern E, Ziemssen F, Ziemssen T, isar. Adult polyglucosan body disease: a postmortem correlation study. Neurology. 2003;61 (2):263-5.http://dx.doi.org/10.1212/01. WNL.0000073144.96680.CB PMid:12874416. Lee SY, Park JH, Kim SH, Kim TS, Kim WJ, Choi YC. A case of adult polyglucosan body disease. Yonsei Med J. 2007;48(4):701–3. http://dx.doi.org/10.3349/ymj.2007.48.4.701 PMid:17722245 PMCid:PMC2628064. Rubin, E. and Farber, J. L. (1988) Cell injury. In “Pathology”, ed. by E. Rubin and J. L. Farber, J. B. Lippincott, London, pp. 2-33. Gati I, Ossy L. Heat shock protein 60 in corpora amylacea. Pathology Oncology Research. 2001 ;7(2): 140-4. http://dx.doi. org/10.1007/BF03032581 PMid:11458278. Iwaki T, Hamada Y, Tateishi J. Advanced glycation end-productsand heat-shock proteins accumulate in the basophilic degeneration of the myocardium and the corpora-amylacea of the glia. Pathol Int. 1996;46:757–63. http://dx.doi.org/10.1111/j. 1440-1827.1996. tb03545.x PMid:8916145. Kimura T, Takamatsu J, Miyata T, Miyakawa T, Horiuchi S. Localization of identified advanced glycation end-product structures, N epsilon (carboxymethyl) lysine and pentosidine, in age-related inclusions in human brains. Pathol Int. 1998;48(8):575-9. http://dx.doi.org/10.1111/j.1440-1827.1998. tb03953.x PMid:9736403. Baziel GM, Lamers JBK, Gabreels JMF, Wevers AR, Wieneke JA vonGeel, Borm FG. Age-Related Changes of Neuron-Specific Enolase, S-100 Protein, and Myllin Basic Protein Concentrations in Cerebrospinal Fluid. Clin Chem. 2001;38(6):813-6. Singhrao SK, Neal JW, Piddlesden SJ, Newman GR. New immunocytochemical evidence for a neuronal/ oligodendroglial origin for corpora amylacea. Neuropathol Appl Neurobiol. 1994;20(1):66-73. http://dx.doi.org/10.1111/j. 1365-2990.1994. tb00958.x PMid:8208342. Mirjana Bakić: A specialist in dermatovenerology and works at the Clinic for dermatovenerology, Clinical Center Podgorica, Montenegro. She holds a PhD degree in the area of Anatomy and worked as 5 years as assistant at Medical faculty in Podgorica. She has published articles in the both area (Dermatology and Anatomy ) and an active participant in national and regional education and Congresses.